With conventional air conditioning, moisture-laden air is passed over a cooling coil, which causes the moisture to condense. The air is cooled and some moisture is removed. 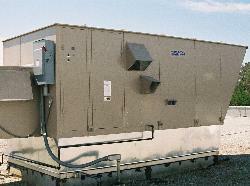 This compromise of temperature and humidity control can result in losses to either efficiency or comfort. Additionally, if the priority is humidity such as in supermarkets, then the dehumidified air must be reheated to a comfortable level before it is sent into the conditioned space. A desiccant system uses special materials (a desiccant) that “adsorb” rather than condense the moisture from the incoming air. The desiccant material used designates the system as either a Dry Desiccant system (crystal-like material such as silica gel) or a Liquid Desiccant system (concentrated liquid solution). The desiccant captures moisture from the air when the air comes in contact with the dry, regenerated desiccant or concentrated desiccant solution.